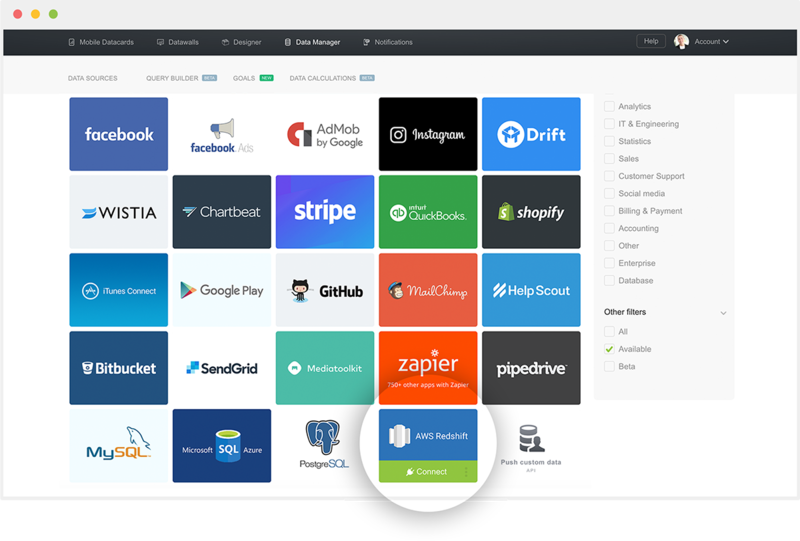 At the moment, MySQL, PostgreSQL, Microsoft Azure SQL and Amazon Redshift are supported out of the box on Databox. 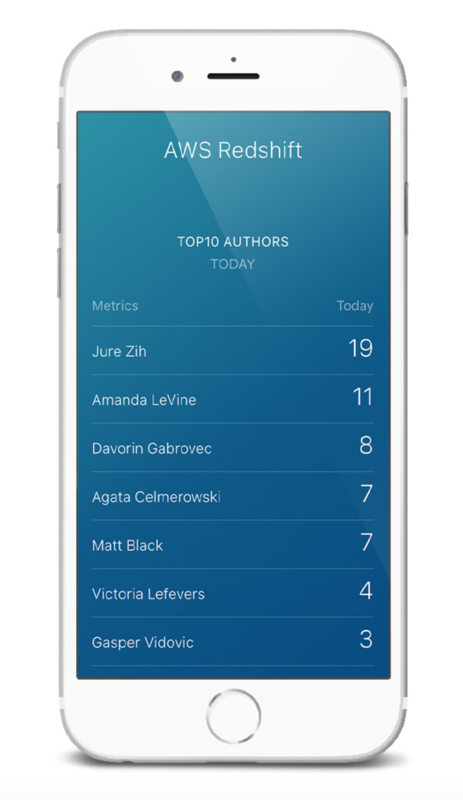 You have the data ready in your database, now it just needs to get visualized in an easy and concise manner so everyone – even your boss – can use. What Will We Accomplish in This Tutorial? 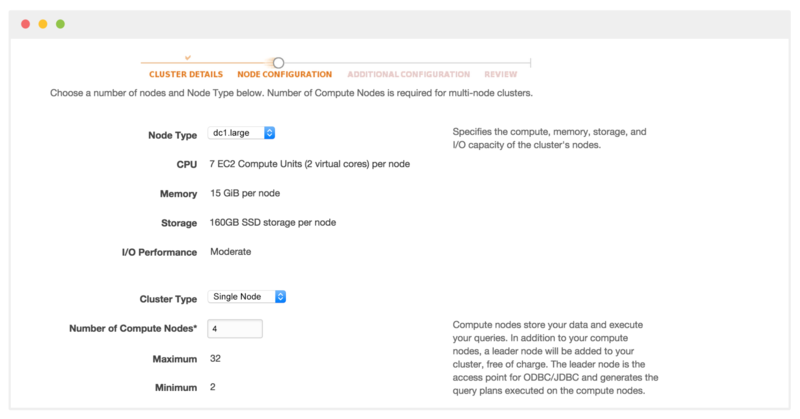 Firstly, we’ll setup a new AWS Redshift cluster from scratch, then we’ll connect it to Databox and confirm that the connection is working. Lastly, we will create a databoard visualizing the data from the cluster. All this without a single line of code, except for the SQL query. 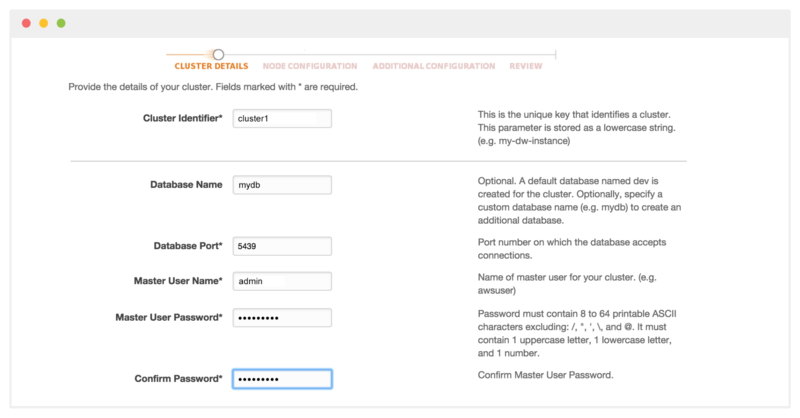 In this section, we will create a new AWS Redshift cluster step-by-step, add a user and setup network rules to allow access from our IP ( 52.4.198.118). Fill the form as needed; defaults are fine in this example. Pick a secure password. Now choose the Node Type; for this example, we’ll use the weakest one: dc1.largeand Single Node Cluster Type. On the next page, your screen settings will also depend on your network setup; most of the defaults are fine for this example. In our example, hostname is redshift1.cssy86qcwxay.eu-central-1.redshift.amazonaws.com. 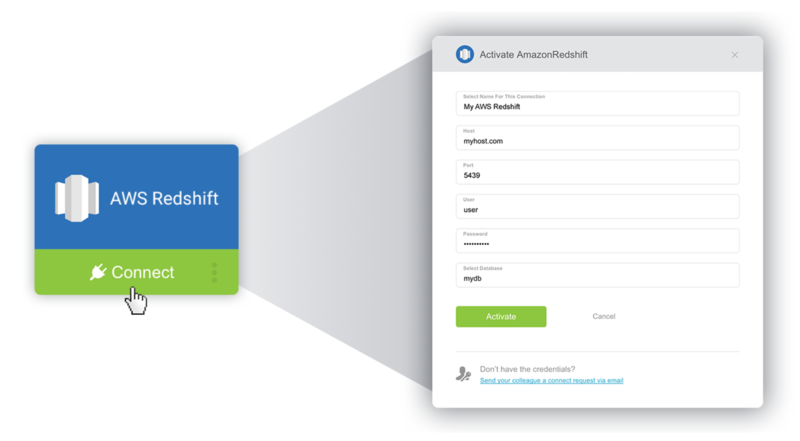 Your server should now be successfully set up to accept requests from our IP ( 52.4.198.118) to your Amazon Redshift cluster database, using your chosen user name and password. Go ahead and load some sample data and it’s ready for connecting to Databox. Go to "Data sources" option and click on "+ New connection". Find the AWS Redshift tile. Enter your connection data in the popup and click the ‘Activate’ button. Default port 5439 is fine in most cases. If all went well, the popup will close shortly and you’ll get a “connected!” message. Great! You have just successfully connected your database to Databox. In the next step, we’ll write a custom query that will regularly fetch data from your database and make it available for use in any databoard. Troubleshooting: If you get a “wrong credentials” message, double-check your user data. If you’re stuck on ‘Activate’ for a minute or so, it’s probably having issues connecting to your database host due to firewall / server / networking issues. (optional) You can rename each column (which will become a metric key in Databox), by clicking on the arrow beside it and typing in a new name. (optional) You can enter a different metric key name pattern or just leaving the asterisk (*), which will create a metric key with the same name as pushed. By default the output (target datasource, where the data gets pushed to), is already selected and is the same as your source data connection. You can use other tokens if needed. Tada! After you saved your custom query, you should see the data on the table. If not, check if the right data source and metric are selected. 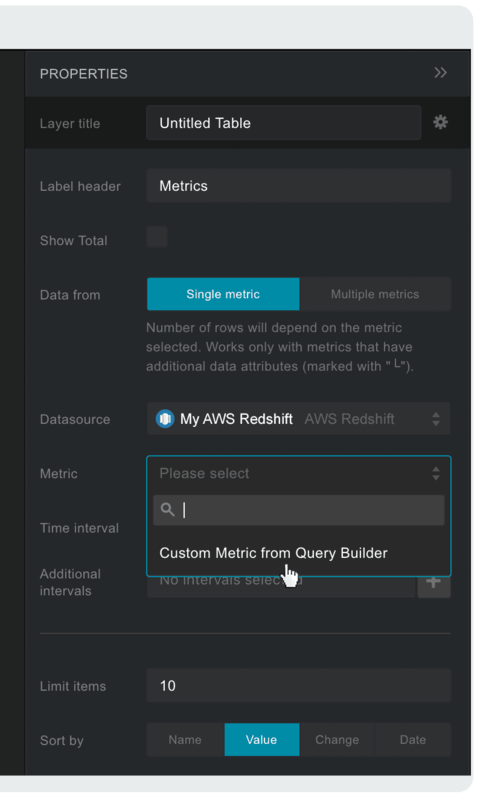 In our example it’s the ‘My AWS Redshift’ data source and ‘└ posts|name’ metric, because we’re pushing posts by names. The date range should be set to ‘Today,’ to see the latest data. We have just written a custom SQL query and displayed its results. Databox will continuously, each hour, fetch data from this resource and store it in the selected target data source (in our example ‘My AWS Redshift’). Note: we’ve used the AS SQL construct in our query (i.e. AS posts). That’s not mandatory, but it will describe the data as a metric key. If you use AS date this column will represent then the date and time of the value (ISO 8601 date and time standard is supported). You can leave it as it is, or rename the result column instead. Semicolon at the end of the query is not needed either. Troubleshooting: If you don’t see any data, double-check your SQL query, try it directly on your database. If it’s not displaying results there, you have an error somewhere in your query. Also check that the AWS Redshift user has necessary permissions to access the database from Databox IP. Well done! 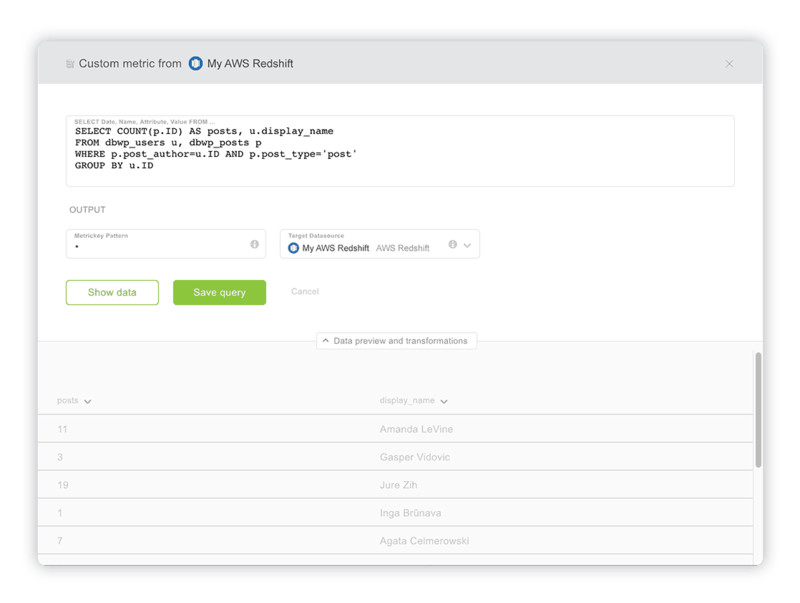 Your AWS Redshift database is now connected to Databox, queries can be executed and then displayed on your mobile / big screen / computer. Go ahead and explore further. 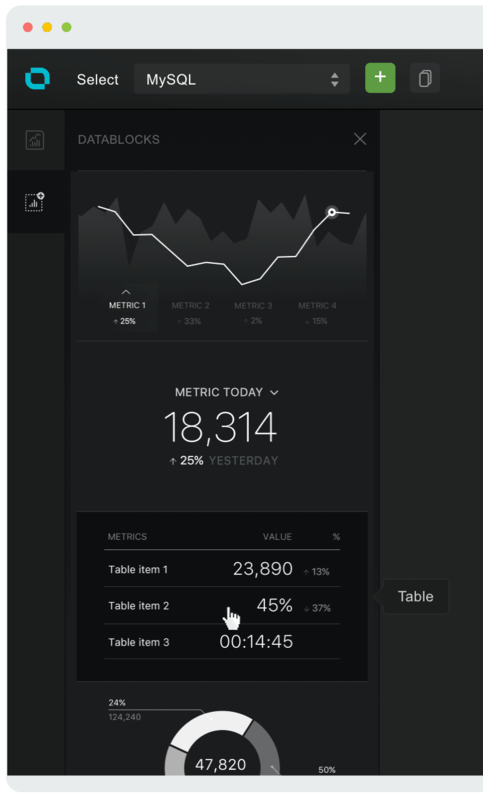 Add more queries, add blocks, explore different types of visualizations. Make that perfect databoard you always needed but didn’t know how to get. Now you can! Clean and professional, right at your fingertips. Only data that matters, without clutter. The possibilities are truly endless. If you’d like to learn more about the tool itself, please read this. Amazon Redshift takes its roots from a very popular open source database, PostgreSQL 8.0.2. It has a strong focus on scalability. Common setup is a clustered environment with a leader node. It follows a MPP (Massively Parallel Processing) architecture, which means that all operations are executed with as much parallelism as possible.